Russian Fiesta driver, Alexey Lukyanuk, has clinched the European Rally Championship despite crashing out of Rajd Polski on the third stage. He became champion because his closest challenger Bruno Magalhaes did not enter the event. The possibility of Magalhaes taking the title on the final round in Latvia is denied as even if he entered and scored maximum points on that event, he would not overtake Lukyanuk. It is thought Lukyanuk is the first major Russian rally title winner. 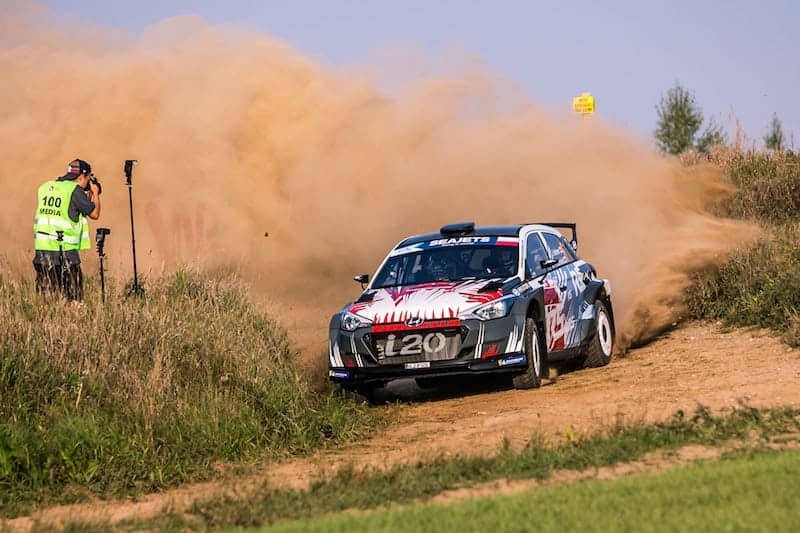 Nikolay Gryazin took over the lead from Lukyanuk on the second stage and held this to the finish, resisting a challenge from Hyundai driver Jari Huttunen whose second place was easily a career best performance. Only a 10 second time control penalty denied Huttunen victory but on a dramatic final stage he made fastest time overall despite finishing the stage with a rear left puncture. A week after Chris Ingram gained a podium WRC2 result in Turkey, he finished third overall on this event. The ever present hazard of roadside trees ended the hopes of both Lukyanuk and fourth placed Lukasz Pieniazek. The top Under 27 driver was Tom Kristensson who finished ahead of Peugeot driver Efren Llaren. He took over the lead when his Opel Adam teammate Martins Sesks rolled. Lukyanuk spoke about his career, highlighted by his physical recovery from a serious crash in 2017, and his ambitions. “We have no plans yet. I really enjoy the atmosphere here in the FIA ERC, it’s so calm, so friendly, the challenge and the drivers here are great. In the world championship it’s different. It’s really tough and demanding but we need to move forward”. He explained a WRC program demands a double size of budget, “so that we could do some development with the car, with my driving style”.